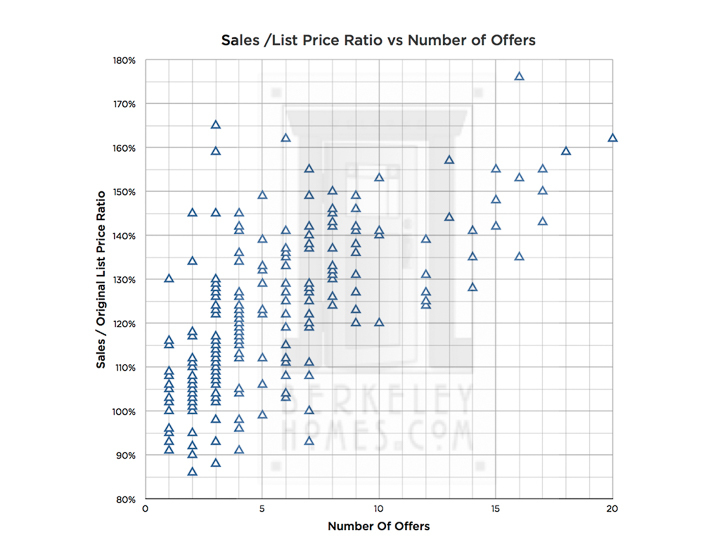 Our market research shows that each additional offer a seller receives results in at 3-5% increase in price. Our listings have sold for 30 – 53% above the list price! Pricing is an art. 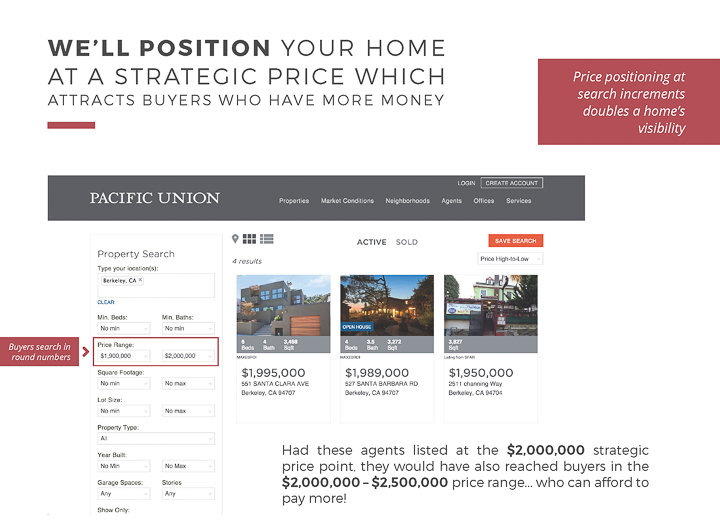 When we meet, we’ll review market conditions so you’ll know the list price which paints the most beautiful picture for you! Strategic pricing exposes your home to more buyers … and particularly those who can afford to pay more. I researched how strongly Zillow’s Zestimates® compared to actual market value. Two homes on Contra Costa in Thousand Oaks closed within 46 days of each other. 868 Contra Costa sold for $473,826 more than the $1,167,034 Zestimate®, 910 Contra Costa, only 5 doors away, sold for $437,681 less than the $1,102,681 Zestimate®. $900,000! Thus, the answer to the $64,000 question “How accurate is Zillow?” … not very accurate at all! 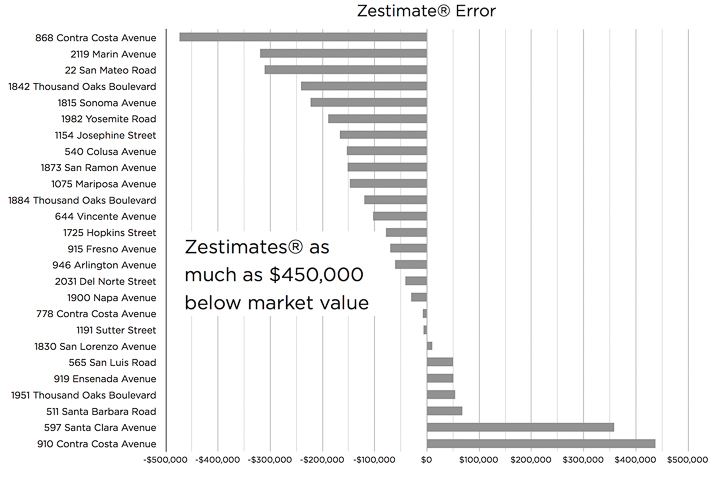 Here’s how the Zestimate® compared to actual sales prices – over half of them were off by more than $100,000. Call us at 510-526-6668 when you’re ready to find out what your home’s really worth in todays’ market! It was an absolute stroke of luck and a real pleasure for us to put ourselves in the hands of such true professionals. We had lived in our home in Albany for over twenty-seven years and we were apprehensive that putting it up for sale would be a trying and difficult process. Quite the contrary, you kept us informed and updated throughout the process. Things moved very quickly and the evening we received the many offers you obtained was exciting and very fulfilling. Finally, I want you to know that we both regard you as being truly sincere and fine people! This doubles your online visibility by pricing the way buyers search … in round price increments. A simple example – Listing a home at $1,995,000 means it’s only seen by buyers searching in the $1,500,000 — $2,000,000 price range. Had it been listed at $2,000,000, it would have also been seen by buyers searching in the $2,000,000 — $2,500,000 price range … and they have more money! We had about 14 offers and the house sold well (well, well!) over asking price. We could not have been happier with the outcome. Carol and Ira are the consummate real estate professionals and I highly recommend them.